The SignWriter dictionary entries are being compiled from several sources including: Concise Dictionary of Middle Egyptian, Raymond O Faulkner; Wörterbuch der Ägyptischen Sprache, Adolf Erman and Hermann Grapow; A Coptic Dictionary, Walter Ewing Crum. 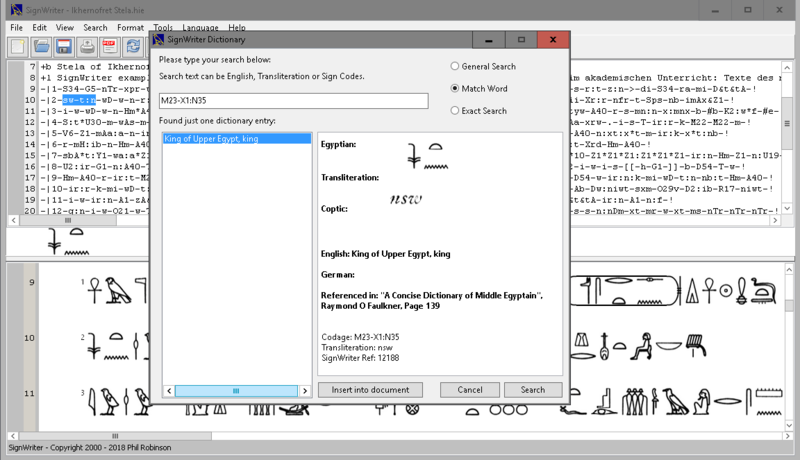 Creating an electronic hieroglyphic dictionary has presented some interesting challenges. It needs to be capable of displaying a mixture of langauge outputs; English, Hieroglyphic, Transliteration and Coptic. The dictionary has been build and indexed to be fast to search allowing you to find results quickly. There are now 25,000 entries but more are added all the time and corrections and updates are being made. The dictionary contains references to source, examples, and can be searched using English, Egyptian, Coptic or Transliteration (MdC).